To begin, go to My Account > Manage Users. On the 'Users' tab you can view general information on all your users. You can sort by first name, last name, etc. 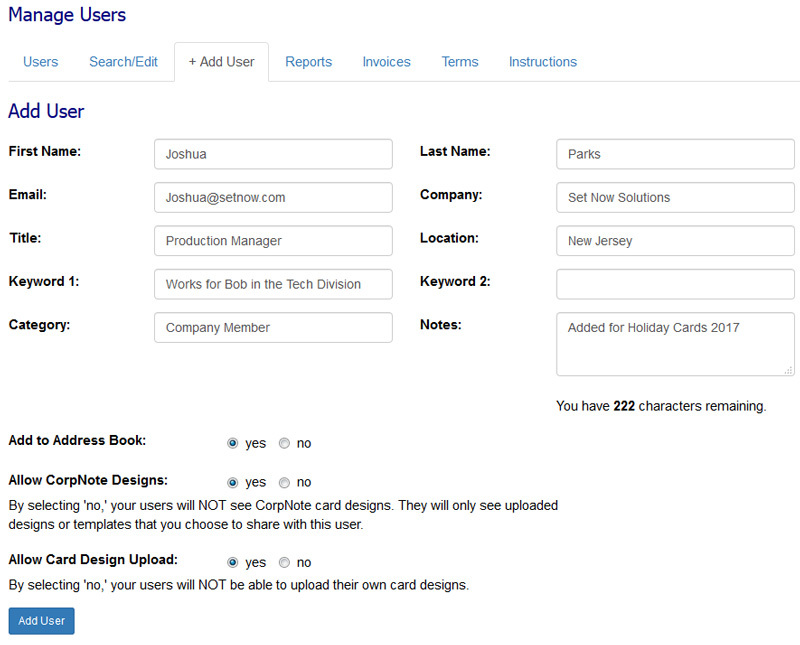 ; download a full list of your users; and send an eCard to all your users. 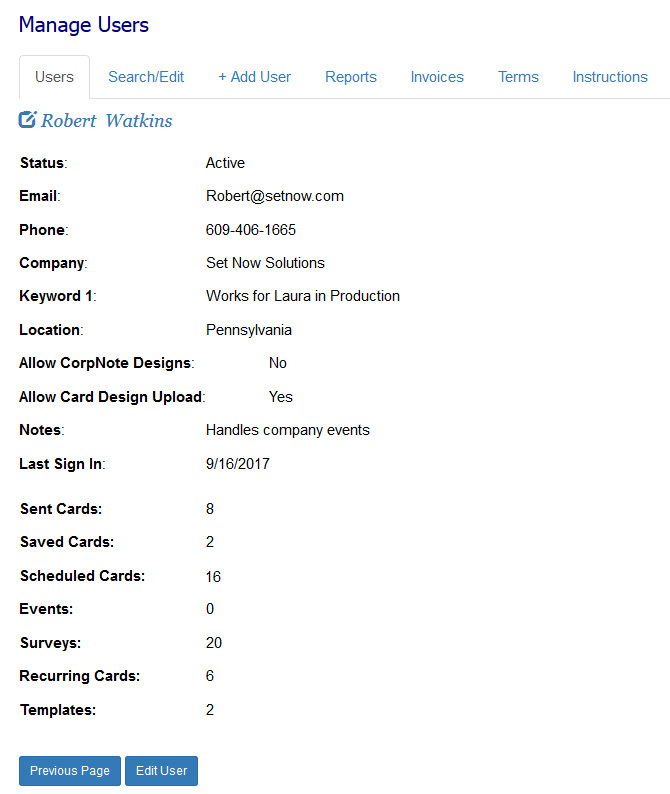 Click the view icon to see information specific to that user such as general usage stats: when they last signed in, how many eCards they have sent, and whether they have events or surveys (see example). 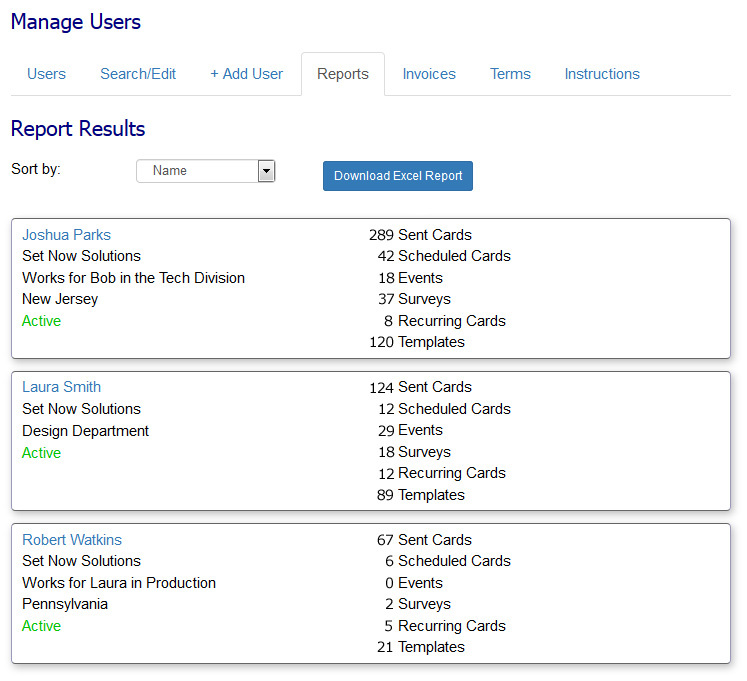 To obtain aggregate information on all of your users, click the "reports" tab. This enables you to select the information you would like to see. You can also download this report into a MS Excel compatible file (see example). To see usage stats for your shared uploaded eCard designs and shared eCard templates, please refer to those administrator tutorials for details. Click the 'Add User' tab and enter the required information. Complete as much information as you can on the form. You can also control whether a specific user can use CorpNote eCard/invitation designs and whether they can upload their own designs (see example). You can choose to not allow their own designs but you are still able to share your own uploaded eCard/invitation designs with any of your users. If you do not choose the block options above when adding the user, there are some rules that will apply later should you change your mind. See the "edit user" tutorial below for more information. 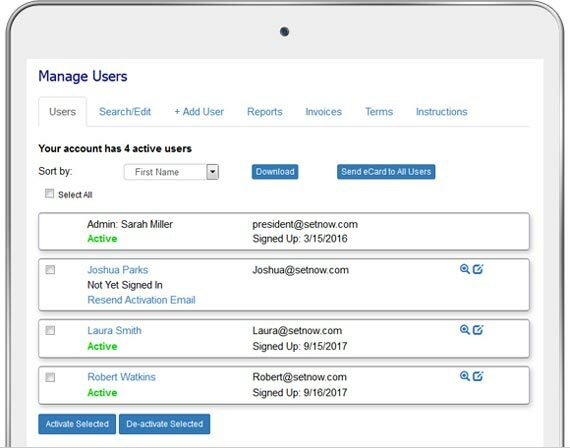 After you add a user, they will receive an email with sign-in instructions and a temporary password that they will need to change. 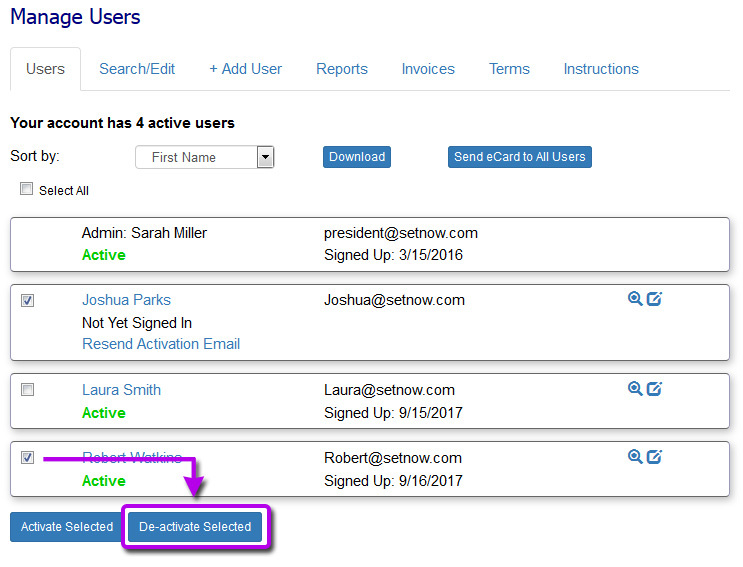 You can search for users based on all fields you entered as well as by active/inactive status. Click the edit icon next to a user's name to change information for a user. 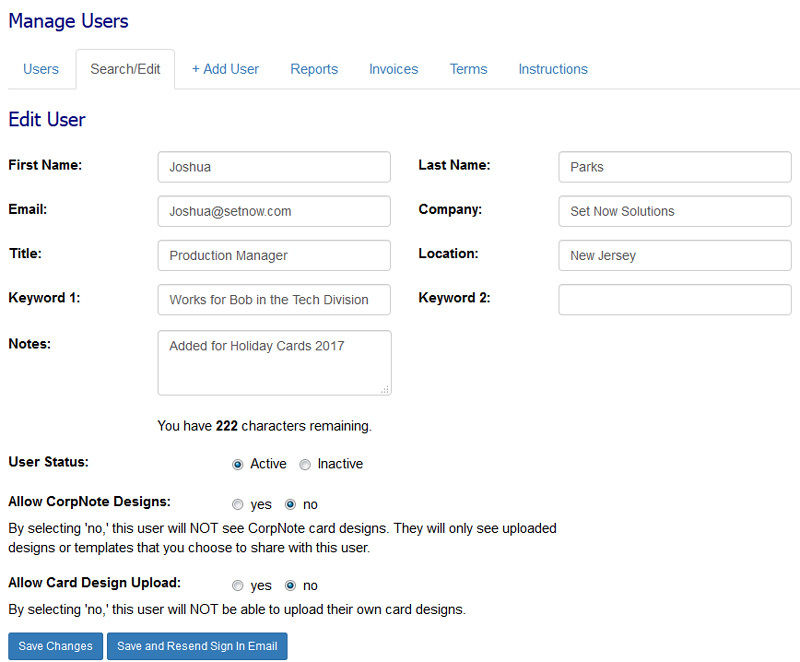 You can still control whether a specific user can use CorpNote eCard designs or upload their own eCard designs, but if they have already uploaded eCard designs or used a CorpNote eCard design, they can still use those specific designs after you change this setting. Click the edit icon next to a specific user's name. On the edit screen, select user status "inactive" and save your changes. You can de-activate multiple users at the same time by checking the box next to each user you would like to make inactive and then click the button "De-activate Selected." (see example). You can provide instructions that will appear on your user's billing page. First go to My Account > Billing & Password, click the "Billing Contact" tab and complete all pertinent billing information. You can have a different billing email address than your CorpNote account email address. 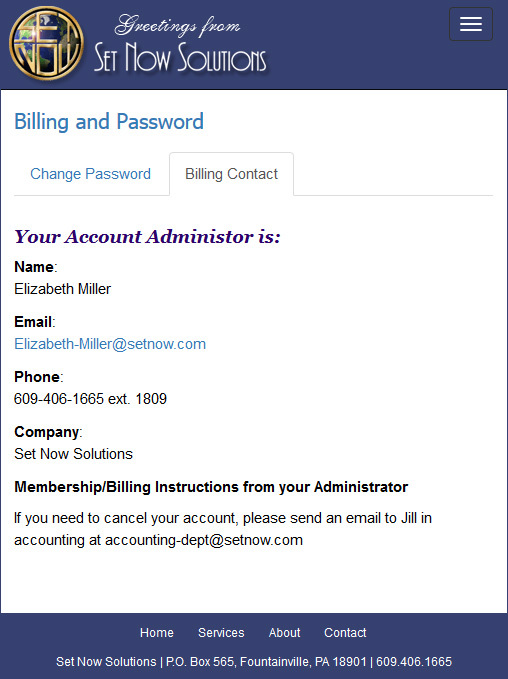 When your users go to My Account > Billing & Password and click on the "Billing Contact" tab, they will see the billing contact information you provided (see example).